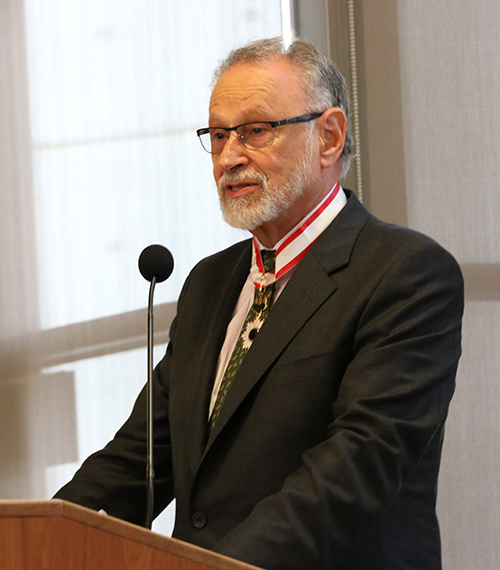 For over 45 years, Professor Emeritus Ellis Krauss at the UC San Diego School of Global Policy and Strategy (GPS) has contributed to promoting academic exchange between our two countries, improving the understanding of Japan at the School as well as nationwide. 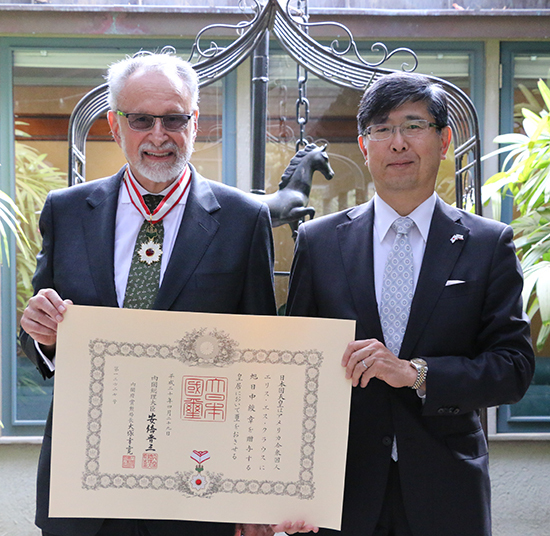 On April 29, 2018 (Japan Standard Time), Krauss was awarded The Order of the Rising Sun, Gold Rays with Neck Ribbon, which is the third of seven classes, and is the highest level any ordinary citizen can receive. A leading expert in Japanese politics and diplomacy, Professor Krauss has written more than 100 papers and books on these subjects. Since the awards inception in 1875, and since 1981 when it has been conferred on non-Japanese recipients, only a handful of contemporary American political scientists have received the honor. “It’s a very prestigious award for foreigners, the first two classes are usually given to heads of state, royalty and high officials. I’m also in the ranks with celebrities like Clint Eastwood and George Takei,” laughs Krauss. The extensive months-long selection process consisted of a two-hour interview on the phone with the Consulate General of Los Angeles, innumerable emails back and forth and stringent background checks. This cautionary process ensures award recipients are not political extremists or biased against Japan. Celebrated for his impact on Japanese academics throughout his career, Krauss also headed the GPS Global Leadership Institute for four years in the late 90s, back then when the Institute’s primary focus was to create executive education courses for ministry officials and economic experts of various countries, including Japan. Krauss remains very active in retirement. Working on his newest co-authored book, forthcoming in 2019, titled “Reluctant Warriors, Conflicted Allies: Germany, Japan, and the International Security Order,” the tome focuses on the security implications of Germany's and Japan's anti-militarist constitutions and subcultures. Helping students develop as global leaders, Krauss has returned to GPS to teach several classes since retirement, remaining enthusiastic about teaching and mentoring, including former students and GPS alumni John Nylin ‘97, Foreign Service officer at the U.S. Department of State and Kuniaki Nemoto ‘09, Associate Professor of Japanese Politics at Musashi University, Japan. When asked to share a favorite memory of his time at GPS, he recollects his conversations with fellow colleagues like Professors Peter Gourevitch, Susan Shirk, Stephan Haggard, Ulrike Schaede, Barry Naughton and former colleagues Andrew MacIntyre and Miles Kahler, and the late Bruce Lehmann. At the conferment ceremony, held Sept. 27 at the UC San Diego Ida & Cecil Green Faculty Club, former colleagues, students, Japanese leaders and lifelong supporters gathered to honor Krauss for his spirit of collaboration and intellectual fearlessness. The ceremony was silent and powerful as Krauss received the decoration, bowing in respect to Akira Chiba, Consul General of Japan in Los Angeles. Awarded on the 50th anniversary of his first trip to Japan, Krauss was celebrated by friend and co-author, Dr. Robert Pekkanen of the University of Washington and lifelong friend and colleague, Dr. T.J. Pempel of the University of California, Berkeley. Glasses were raised in honor as Dean Peter Cowhey led the champagne toast to celebrate a lifetime of achievement. 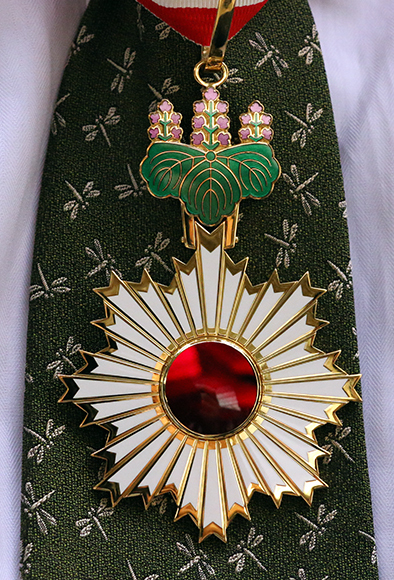 The badge is comprised of several parts, featuring rays of sunlight from the rising sun, referencing Japan’s nicknapme “Land of the Rising Sun.” The gold rays with neck ribbon symbolize the level of the rank. Representing his feelings at receiving this honor, Krauss referenced the late Senator John McCain’s speech to the Naval Academy in 1993. For an overview of the ceremony, please visit our Flickr album.